Brazilian sports clubs have been traditionally organised as associations. Initially conceived as entities merely dedicated to educational and leisure aspects that sports practice could provide to a community, sports clubs did not usually have an economic activity as a purpose (let alone as their main purpose). Law No. 9,615 of 1998 (also known as Pelé's Law, after Brazil's most famous footballer) established that sports clubs engaging in educational, amateur sports activities (as opposed to sports activities practised by professional athletes who receive payment for their performance) should organise themselves, and be managed, in the legal form of an association. Any sports club organised as an association must primarily focus on the development of sporting practice itself, but many activities perceived as vital to the existence of a sports club (negotiating athlete transfers, media, naming and image rights, or product licensing, to name a few) may be legally pursued by sports clubs as a secondary activity. Sports clubs primarily acting for a profit from economic activities – that is, those employing capital, workforce (professional athletes) and equipment for the sole objective of obtaining profits from sports events – must migrate from their initial organisational legal form (association) to any of the corporate organisation forms provided by the Brazilian Civil Code (namely, general partnerships, limited partnerships, limited liability companies, joint-stock companies, or limited partnerships with share capital). Sports clubs do not usually migrate to those specific forms of corporate organisation in Brazil, even though such migration is more in line with the purposes of professionally developed sports activities worldwide. This inertia is explained by the fact that most sports clubs engage in several sports modalities (e.g., football, volleyball, swimming) that enjoy different levels of possible commercial exploitation, which prompts sports clubs' managing officers to opt for an association as their 'umbrella' legal form of choice. Under Pelé's Law, the exploitation and management of professional sports activities constitute an economic activity and are thus subject, among others, to the principles of financial and administrative transparency, sound management and accountability. if the managing officer is declared insolvent. Upon manifest occurrence of any of the above, prompt action must be taken for removal of a managing officer, regardless of any express provision to the contrary in the by-laws of a sports club or sports organisation. To ensure sounder governance of sports clubs and organisations, Pelé's Law sets out minimum accounting requirements for their financial statements, while also ensuring unrestricted disclosure of management-related documents and information to all members or shareholders gathered at a club or organisation's annual general meeting. Further, any proceeds from the credits or assets held by sports clubs, sports management organisations or organised sports leagues must always revert solely to their own benefit. Clubs and organisations may not use their assets to pay up their own capital stock or else offer them as collateral to third parties unless the absolute majority of members or shareholders gathered at an annual general meeting decide otherwise and in keeping with the by-laws. If any damage is caused to a sports club or organisation's assets owing to culpable mismanagement, the managing officers will pay from their own assets. Besides, managing officers are jointly and severally liable for reckless management or any other acts that run against a sports club or organisation's by-laws. Pelé's Law also establishes other general obligations of sports organisations taking part in any competition involving professional athletes, regardless of the legal form adopted by them. Clubs and organisations must prepare separate financial statements for each economic activity they engage in. These financial statements must separate any recreational and amateur sports activities from a club or organisation's economic activities, as prescribed by law and in the general accounting standards and principles established by the Brazilian Federal Accounting Standards Board. The financial statements must be independently audited and published on the sports club's own website and, if applicable, they must also be published on the website of the sports league or organisation to which the club is admitted. Sports organisations that receive public funding must also submit their approved financial statements, together with the reports of independent auditors, to the Brazilian National Sports Council (CNE). Failure to do so will trigger the penalties set out in specific tax, labour and social security legislation, as well as civil and criminal liability, also rendering the managing officers of a sport management organisation, sports league, club or organisation ineligible for five to 10 years to perform any (elected or appointed) duties in any sports club or organisation, as well as in any of the organisations, companies or associations directly or indirectly linked to professional competitions of the respective sports. Sports clubs or organisations that breach the provisions set out in Pelé's Law, as briefly discussed above, are subject to different levels of punishment, such as prompt removal of managing officers from any managerial position, or nullity of all acts taken on behalf of the sports club or organisation that may relate to the offence. Managing officers usually include the president of the sports club or organisation, as the case may be (or an agent who currently performs the presidential duties), as well as any person in a managerial position who commits an offence or fails to act to avoid the offence being committed. Brazil's exclusive jurisdiction for resolution of sports disputes rests with the Superior Court of Sports Justice, which does not belong to the general organisation of the Brazilian judiciary branch, and is governed by its own procedural rules. Its decisions derive from the application by its judges and courts of, inter alia, the Code of Sports Justice, enacted by Resolution 29 of 2009 issued by the CNE, and of Pelé's Law, supplemented by its own precedents. As such, the Brazilian judiciary branch is not deemed to be the appropriate venue for starting sports disputes: it does not have the necessary practical expertise to deal with the decision-making process that the parties would expect from a ruling on sports matters, nor does it have the adequate procedures in place for analysis of such disputes under the civil law system adopted in Brazil – hence, the judiciary plays only a residual, last-resort role in respect of sports disputes (as further discussed below). The Superior Court of Sports Justice formally has a private and autonomous nature, but incorporates into its rulings and decisions both state and private regulatory elements as set forth by different sports leagues. This mixture of different sources of governing law is, therefore, the single most tangible sign of state intervention in institutions and sports practices with a view to ideally safeguarding compliance with constitutional principles and legal remedies in the realms of sport practice. The Constitution of 1988, which established the Superior Court of Sports Justice, states that matters solely involving sporting practices should first be brought to the attention of the Superior Court of Sports Justice, while not denying access to the judiciary with regard to those disputes as well. Such access, however, is defined by both the Constitution and ordinary laws as being residual in nature, and must be raised by the parties only if constitutional principles are violated by the rulings of the specialised Superior Court of Sports Justice jurisdiction. In other words, the parties must have exhausted all instances of the constituted competent Superior Court of Sports Justice before taking the dispute to the judiciary. Under this particular organisation of access to the courts, some subjects that would intuitively be placed under the radar of the Superior Court of Sports Justice, however, lie outside of it; for example, a violation of rights that can be remedied only by other courts with exclusive jurisdiction. Issues directly concerning labour relations between sports clubs and professional athletes, for example, must always be directed to specialised labour courts. The principles that guide the decision-making process of the Superior Court of Sports Justice are the same as those generally adopted by the judiciary. As such, none of the principles of full defence, expeditiousness, adversarial proceedings, procedural economy, impartiality, independence of the judge, legality, public morality, proportionality and reasonableness are excluded. In Brazil, arbitration is mainly regulated by Federal Law No. 9,307 enacted on 23 September 1996 (as amended by Law No. 13,129 of 26 May 2015), and is usually perceived as a faster, more flexible and sophisticated method of dispute resolution than litigation before state courts. Sports arbitration in Brazil can, generally speaking, be practised by any parties that have civil capacity. The dispute to be settled by arbitration must involve only disposable rights (rights that may be transferred, such as property rights), and the content of an arbitral award must not be in conflict with good morals and public policy rules. To submit a dispute to arbitration under Brazilian law, the parties must execute an arbitration agreement that may be in the form of either an arbitration clause or a submission agreement. The execution of such clause or agreement will create an arbitration commitment under which the parties irrevocably agree to waive their rights to refer the dispute to any ordinary jurisdiction. The Brazilian Football Confederation (CBF) has appointed a sports arbitration court located in Brazil as the arbitration body that is competent to resolve any issues or disputes arising from sports competitions coordinated by the CBF. All clubs, athletes, referees, coaches, doctors, trainers, assistants, intermediate athletes and others involved in competitions coordinated by the CBF are obliged to make use only of the sports arbitration court to resolve any issues, litigation or disputes that may occur in any of those competitions, thus being denied access to ordinary jurisdiction. The only exceptions are those specified in the FIFA regulations. An arbitral award produces the same effect as a decision handed down by the judiciary. Such arbitral award is enforceable in the same way as a judicial enforcement instrument. A foreign arbitral award must be recognised by the Superior Court of Justice to be enforceable in Brazil. 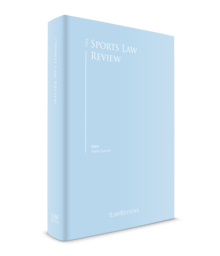 Sports law in Brazil has generally followed the same process of legal segmentation and specialisation as found in other areas of economic, social and political activities, opening up an era termed the 'Era of Statutes' conceived to address legal issues once handled through the application of general principles of civil and criminal law. Law No. 10,671 of 15 May 2003 (the Sports Fans Act) and Pelé's Law form the legal core of the liability regime applicable to sports events, superseding the application of the Civil Code under the legal principle that a special law supersedes the adoption of general laws (lex specialis derogat legi generali). In this sense, Pelé's Law equates a sports fan who attends a sports event to a consumer under a consumer relation and, as such, strict liability applies as established in Law No. 8,078 of 11 September 1990, also known as the Consumer Protection Code. Under this regime, organisers of sports events are ultimately responsible for ensuring not only that spectators and athletes alike have the necessary venue and material conditions for the organisation of a given match or sports event, but also that their safety against risks that can ultimately be traced to the organisation of the sports event itself is effectively guaranteed. A sports event organiser is said to have strict liability because its role in the sports event itself cannot be viewed merely as a 'best efforts' obligation under the circumstances. Aside from strict liability, the managing officers of organising entities are also deemed jointly and severally liable for any damage caused to spectators attending sports events organised by them. Sports organisations must disclose the basic guidelines of their relationship with spectators, which must contain information on access routes to the stadium and to the point of sale of tickets, the organisation's financial transparency mechanisms (including provisions regarding independent audits), and the means of communication between spectators and sports organisations. Communication between spectators and sports organisations must occur through the creation of an ombudsman department, the establishment of an advisory body composed of non-member spectators, and the recognition of member spectators whose rights are more restricted than those of other partners of the sports organisation. Sports organisations are liable for any violation of the Sports Fans Act. Sanctions imposed on such sports organisations include: suspension from office or removal of managing officers; an organisation's disqualification for tax benefits; or six-month ineligibility for federal government funding. Sports spectators may organise themselves into organised sports fan clubs constituted as a legal entity, which must keep a registration of all its members and managing officers. If, during a sports event, a sports fan club or any of its members or managing officers promote any kind of rioting or turmoil, encourage violence, or invade a place that is restricted to authorised people only, such sports fan club (and its members and managing officers) will be prevented from attending sports events for up to three years. Such sports fan club will also be liable for any damage caused by its members and managing officers to the sports venue, its environs, or on the way into and from the event. According to Law No. 12,395 of 16 March 2011, the arena rights (that is, the image rights of professional athletes during any sports event in which they participate), belong to the sports clubs and organisations, and consist of an exclusive right to negotiate, authorise or prohibit the capturing, fixing, transmission, retransmission or reproduction of images, by any means or process. Unless there is a collective agreement to the contrary, 5 per cent of the revenues from exploitation of audiovisual sports rights are transferred to the professional athletes' unions, which will redistribute these values equally to the professional athletes who participated in the specific sports event. The costs related to arena rights do not extend to occasional reproduction of the sports event for journalistic, sporting or educational purposes only. These rights are established by the Federal Constitution, which states that protection of an individual's participation in a collective work and the reproduction of human voices and images, including in sports activities, must be as provided by law. However, the arena rights should not be confused with image rights, given that the arena rights are owned by the sports entities, which can thus negotiate, prohibit or authorise, either for payment or free of charge, the transmission of the show or sports event in which they participate. Professional exercise of any athletic activity characterises an employment relation in Brazil, and must be recorded, as any other professional activity, in the athlete's work and social security booklet, which is a personal identification document described in Law No. 5,452 of 1 May 1943, known as the Consolidated Labour Laws (CLT), as further amended by the major labour overhaul enacted in Brazil in 2017. This employment relation is also specifically governed by the provisions of Pelé's Law, which affords special treatment to the career of professional athletes. However, the reality in Brazil is that employment contracts satisfying CLT requirements are generally restricted to certain sports, and mostly to football players. For the vast majority of other sports, an informal hiring model still prevails, in which amateur athletes' wages are preferably paid by general sponsors (not by the sports clubs or associations in their own name). Specifically with regard to football (by far the most popular sport in Brazil), Pelé's Law recognises the current reality of economic exploitation of football as regards other sports modalities, and establishes express, mandatory provisions for employment contracts only when such contracts are between professional sports clubs and football players. Professional football players must execute employment contracts with sports clubs in written form, specifying the names of the respective parties and respective remuneration. These requirements do not apply to employment contracts for other sports modalities. Professional football employment contracts must also contain a specific pecuniary fine for default capped at 100 times the amount of annual remuneration owed to the football player, which must also be provided in written form or otherwise arbitrated by specialised labour courts upon the occurrence of an event of default under the employment contract. Other aspects specifically required for professional football employment contracts are: duration (from three months to five years); registration (football employment contracts must be filed with the national football confederation); a professional athlete's minimum age of hiring (16 years is the minimum hiring age); and mandatory provisions on contract renewal. In addition, football clubs have a right of first refusal upon first renewal of a football employment contract. When it comes to professional athletes' employment contracts, several practitioners argue that arbitration constitutes a more advantageous method of dispute resolution than the usual submission of each and every labour dispute to the Brazilian labour courts, on grounds that arbitration, being guided by the principles of expeditiousness and higher expertise, can provide faster and fairer decisions. Pelé's Law does allow interested parties in sports organisations to settle disputes by arbitration, provided that such alternative has been dealt with in a collective convention or agreement between the employer and its employees, and the arbitration is only initiated on the express consent of both parties through an arbitration clause or arbitration agreement. Antitrust conduct in Brazil is governed by Law No. 12,529 of 30 November 2011 (the Antitrust Law), which applies to individuals and legal entities, as well as to any associations of entities or individuals, whether de facto or de jure, incorporated or unincorporated, and even if engaged in business under the legal monopoly system, including sports organisations. As such, sports organisations engaging in economic activities that are in conflict with the Antitrust Law may be held liable for such acts. Since they also perform an economic activity, sports federations, confederations and leagues are also subject to the Antitrust Law even when they are organised as non-profit organisations. Sports organisations may be established as non-profit entities, which are eligible for tax immunity, or as charitable, recreational, cultural and scientific institutions or civil associations, which are exempt from tax, as long as they do not engage in professional sports. In such cases, the sports organisations must have satisfied all corresponding legal requirements. Professional sports entities that do not fall into any of the categories mentioned above are regularly taxed as any other Brazilian entity. Thus, the exploitation and management of sports activities constitute professional economic activities, and, consequently, those entities must be organised as required by the Civil Code and are subject to the following taxes and contributions: corporate income tax, contribution on profits, social contribution, and profit participation programme contribution. One of the most noteworthy aspects of Brazil's tax incentive system is Law No. 11,438 of 29 December 2006 (the Sports Incentive Act), as regulated by Ministry of Sports Ordinance 269 of 30 August 2018, which establishes that sports and para-sports projects, once approved by the Ministry of Sports, may receive direct investments treated as allowable expenses on the taxpayers' income tax returns. The Sports Incentive Act establishes that corporations taxed on their book income may treat their direct contributions to approved sports projects (either in the form of a one-off donation or via sponsorship) as deductible expenses at up to 1 per cent of their income tax payable in any single fiscal year. For individual taxpayers, contributions are allowed as expenses at up to 6 per cent of their income tax payable in any single fiscal year. Such contributions must be channelled into the development of single sports and para-sports projects, as previously approved by the Ministry of Sports and falling into at least one of the following categories: educational sports, inclusive sports and high-performance sports, organised in the form of amateur competitions. However, the law imposes two important limitations on contributions allowed as deductible for corporate or individual income tax purposes. any entity deemed to be affiliated with, or the parent or a subsidiary of the sponsor or donor, or any entity having among its members, shareholders, directors or partners any of the above-mentioned entities. Second, contributions cannot be deductible for corporate or individual income tax purposes if they serve for direct remuneration of professional athletes in any sport modality. The accountability of sports projects benefiting from the tax incentive regime under the Sports Incentive Act is exercised through enforcement of the relevant standards applicable to processing, evaluation and approval by the Ministry of Sports for the framework of each sports project under scrutiny, as well as through monitoring and tracking of the implementation of duly approved projects by the Ministry of Sports. Ministry of Sports Ordinance 269 deals with compulsory accountability requirements for approved sports and para-sports projects. Besides the need to prove the attainment of those objectives and goals outlined in the original project, the sports organisation must submit documents, financial statements and even photographic material to evidence that all contributions received under the tax incentive programme set out in the Sports Incentive Act were invested accordingly. If any irregularity is detected, the experts designated by the Ministry of Sports to check observance of accountability procedures may order a freeze of bank accounts held by the sports organisation or even arrange for blacklisting of the defaulting sports organisation before the integrated financial management system of the federal government. The economic exploitation of sports activities in Brazil is governed by the principles of financial and managerial transparency, sound management, accountability of managing officers, and differentiated treatment between professional and amateur practices. Disregarding any of these principles will trigger administrative proceedings, which may ultimately result in sanctions (such as warnings, written censures, fines, suspension and disaffiliation or disassociation) being imposed on sports clubs and organisations. These sanctions apply to specific sports issues such as doping, betting and manipulation. The Brazilian legal system incorporated, through Decree No. 6,653 of 18 November 2008, the International Convention against Doping in Sport signed in Paris on 19 October 2005 to prevent and combat doping in sports, with the ultimate aim of eradicating such practice in Brazil. Decree No. 8,829 of 3 August 2016 approved a new administrative structure for the Ministry of Sports, which includes the Brazilian Anti-Doping Agency, whose duties encompass the promotion and coordination of anti-doping activities in professional and amateur sports, in an independent and organised manner, both within and outside organised competitions, in accordance with the rules established by the World Anti-Doping Agency, as well as with the protocols and commitments assumed by Brazil. There are also rules issued by the Ministry of Sports, through the CNE, regulating the performance of doping tests by competent authorities during sports competitions, particularly Resolution No. 2 of 5 May 2004. Although these rules do not address the performance of doping tests by sports entities on their own athletes or any punishment on sports entities themselves for doping offences detected, the law establishes an administrative penalty on a professional athlete guilty of doping, which consists of suspension from all sporting events, in any modality, for up to 360 days (or, in case of recidivism, a lifetime ban from sports). In Brazil, games and bets are generally regulated by the Civil Code, and can be classified as permitted (authorised or regulated), prohibited (illegal) or tolerated (not illegal). Permitted bets are those expressly allowed by specific laws and regulations, such as federal lotteries and horse race betting (in authorised clubs). Prohibited bets are those generally known as 'games of chance', where chance is a decisive factor. Under Article 50 of Decree-Law No. 3,688 of 3 October 1941, such bets are misdemeanours punishable with fines and even imprisonment. Tolerated bets are those for which results do not depend exclusively on chance, but also on the intellectual or physical skills or ability of players. They are not considered misdemeanours, but any obligations arising from them are unenforceable. In general, sports bets in Brazil are regarded as games of chance and, as such, are not allowed unless authorised by a specific law in this regard. One of the currently authorised types of sports betting is the Federal Sports Lottery. A form of lottery run by the federal government, the Federal Sports Lottery was created by Decree-Law No. 594 of 27 May 1969, and is regulated by Decree No. 66,118 of 26 January 1970, which establishes the allocation of its revenues. The rules and regulations applicable to the Federal Sports Lottery allow the exploration of all types of games related to sports results. There are currently two betting modalities in the Federal Sports Lottery for football, which remains the sole sports modality in Brazil that is capable of providing enough betting revenue to justify its implementation. These are 'Loteca', which is the traditional sports lottery where bettors can bet on the results of football matches, and 'Lotogol', where bettors can bet on the exact results of up to five different football matches. The revenues from such games are mainly channelled into family and juvenile welfare programmes, sports activities, and physical education and literacy programmes. No sports betting in Brazil, as currently regulated, can pose any kind of risk to the state. Because of this, bettors can only be awarded 46 per cent of the total betting amount collected. Any other form of award disregarding this proportion between the betting amount collected and the amount awarded to bettors will not be approved or authorised under prevailing laws, and such sports betting will thus be automatically held to be an illegal game of chance (and, by extension, a misdemeanour). Any competitors, referees, inspectors, managing officers, organisers or individuals who are involved in a sports organisation or a sports event and contribute to manipulation of results will be held liable in the civil and criminal spheres for their acts and implications. Rigging of sporting event results may also be prosecuted on charges of 'loss of chance', by which the injured party may obtain recovery of damages from the offender that engaged in or was accessory to the rigging conduct. The sale of sports events tickets through channels other than those established by the event organiser is forbidden in Brazil as it is held to be detrimental to spectators. The Sports Fans Act establishes that practices related to grey market sales, such as selling sports event tickets for a price higher than that printed on the ticket, or providing, diverting or facilitating the distribution of tickets for a selling price above that printed on the ticket, are criminal offences. Sanctions can vary from one to four years' imprisonment plus a fine. The legal framework for sports in Brazil has recently changed by enactment of Ministry of Sports Ordinance 269, amending the Sports Incentive Act and repealing Ministry of Sports Ordinance 120 of 2009, which regulated the aforementioned law. Ordinance 269 has relaxed the procedures for submission of sports projects by sports entities to qualify for Sports Incentive Act funds, as well as the procedures applying to public and private investors in associating their image with the said initiative. As yet another significant breakthrough, Ordinance 269 introduced greater transparency and agility while also streamlining the fund management procedures to be observed by sports entities, which were even allowed to reassign excess funds from a specific, approved project to other initiatives of their own, which in turn must have been already approved for funding by the Ministry of Sports or under analysis for future approval. A major labour overhaul took place in 2017. It is difficult for law practitioners to assess the implications of this overhaul, but a possible impact from the changes to the CLT is the creation of a category named 'sophisticated worker', covering those who (1) hold a university degree; and (2) receive monthly wages at least twice the amount of the social security retirement income cap (approximately 11,000 reais, as of 2018). Within this context, the provisions of an employment contract executed with such 'sophisticated workers' will be valid and enforceable even if they run against the legal protections and benefits generally granted to workers under the CLT (such as default submission of employment contracts to the jurisdiction of labour courts). This innovation is likely to make the negotiation of employment contracts with athletes who satisfy the two requirements mentioned above significantly more flexible. The themes discussed above are some of the most relevant concerning the application of sports law in Brazil today. Despite the expectations on how different the sports environment in Brazil would be in 2018, given that the country was to host two of the major sports events worldwide (the FIFA World Cup in 2014 and XXXI Olympic Games in 2016), much of the initial projection in terms of improvement in sports infrastructure and institutional framework did not materialise or was severely impacted by the ongoing economic crisis that has ravaged the country since 2015. Sport, as a tool of social policy utterly dependent on public investments in Brazil, has been unable to acquire centrality or priority in public spending within the context of economic and political changes that the country has been through. This is a presidential election year and, as such, naturally stirs nationwide debates over the role that sports should play in the country's social development. Much is expected from elected authorities to address these expectations, to the satisfaction of a strained public opinion, wishful of practical improvements in this area further to the amounts invested in the major sports events hosted in 2014 and 2016. Brazil's next president, Jair Bolsonaro, is promising a liberal agenda, which includes (1) the privatisation of state-owned companies; and (2) implementation of important reforms, such as a broad review of the social security and tax framework. Such agenda is generally viewed positively by the market and strengthens perspectives of greater investment in the country. We would like to think that this may also generate opportunities in the sports sector. 1 Adolpho Julio Camargo de Carvalho is a partner at Pinheiro Neto Advogados.